1) Logs on the test operator (or supervisor) so the operator can be identified in the test results. 2) Accepts the scanned (or typed) serial number of the DUT to include with the results. 3) Instructs the user, step by step, in English and a local language (e.g. Chinese) and with graphic prompts. 4) Checks the DUT for previous test results and references these if found. 5) Programs the DUT with test firmware via the tester’s STM32 discovery board programmer and the STLINK Utility. 6) Automatically performs all tests (approx 50 tests) on each DUT and displays the progress and/or results. 7) Logs all detailed test results in text files for later confirmation / record keeping. 8) Programs each DUT’s results into its on board microcontroller EEPROM memory. 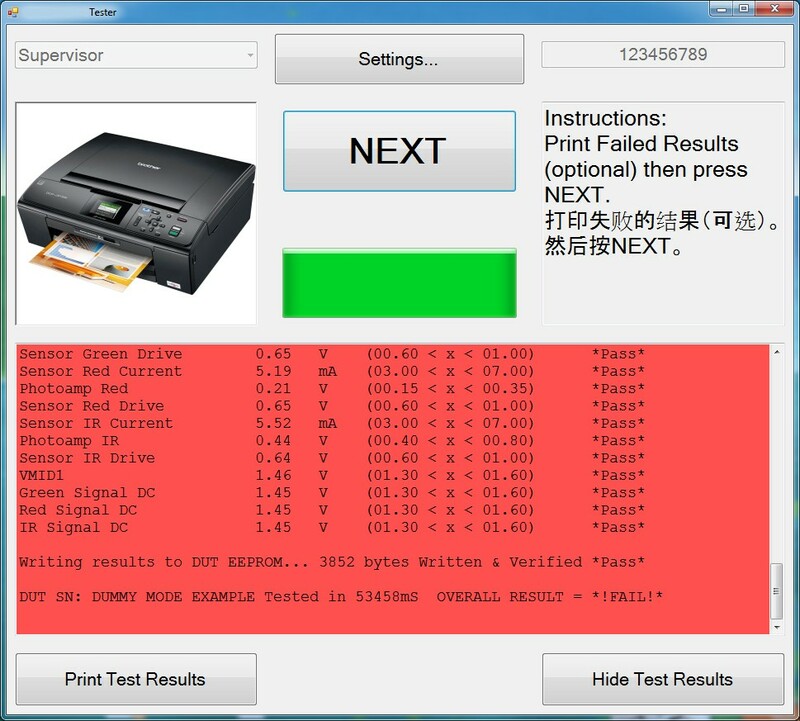 9) Allows a DUT’s detailed test results to be printed out, e.g. to go with failed DUTs for repair. 10) Provides supervisor settings for testing configuration, user names & passwords and com port settings. 11) Performs a self calibration procedure against a known good sample.